When publishers reissue older titles, Asian Books Blog asks them why. Here, John Ross explains why Camphor Press reissued The Teahouse of the August Moon, by Verne Sneider. At the end of the Second World War the United States found itself in the position of an accidental imperial power administering numerous foreign territories. The first major novel to examine this challenge was John Hersey's A Bell for Adano (1944). A U.S. Army officer is placed in charge of a town during the American occupation of Sicily. He brings democracy and other changes to Adano, often siding with the local people against his unsympathetic commander, and - despite seemingly more important matters to attend to - helps the locals replace a beloved town bell, which was taken away by the Fascists. In Vern Sneider's The Teahouse of the August Moon (1951) American-style democracy and capitalism come to the sleepy village of Tobiki on Okinawa in 1945. The easily led-astray Captain Fisby is, with the help of his local interpreter Sakini, implementing the U.S. Army's Plan B. This blueprint for modernization includes establishing a Women's League for Democratic Action and building a pentagon-shaped schoolhouse where the children will learn English. When Fisby mistakenly accepts a gift of souvenirs in the form of two geishas, life in the village and his plans for it spin out of control. The villagers take advantage of their newly arrived democracy to decide that, rather than the pentagon-shaped schoolhouse, they want a teahouse for the geishas. Initially reluctant, Fisby gets caught up in the runaway project, which transforms the entire village economy in unanticipated ways. Fisby's superior, the vainglorious Colonel Wainwright Purdy III, sends a spy to Tobiki to discover what is going on. Teahouse is an immensely likeable satire of the American civilizing mission, and was a phenomenon when it was published in 1951. An award-winning play and hit movie of the same name soon followed, though these lack the punch of the novel. In writing the novel, Vern Sneider drew directly on his personal experiences as a military administrator on Okinawa. While the Battle of Okinawa, the bloodiest clash of the Pacific War, was still raging, Sneider was put in charge of the village of Tobaru. The original population of five hundred swelled to more than five thousand, so rather than the idyllic Tobiki of the novel, it was in effect a refugee camp. Complicating matters was the order for the village to move a new location so a road could be built. Like Captain Fisby lumbered with the ludicrous "Plan B," Sneider found many of the plans he was supposed to implement to be unsuitable and, as a result, he improvised. In this he was helped by his Okinawan interpreter, Nakasone Kamato, inspiration for the memorable character of Sakini. In the new introduction of the Camphor Press edition of The Teahouse of the August Moon, literary critic (and former Okinawa resident) Larry McCaffrey argues that the book occupies an important position in the American war novel canon. He explains it was ahead of its time, prefiguring later pioneering works such as Heller's Catch 22 (1961) and Kurt Vonnegut Jr.'s Slaughterhouse Five (1969); it's "unusual combination of satire, magical realism, and fantasy anticipated their emergence as key formal methods in postmodern fiction by at least a decade." McCaffrey points out the bizarre absence of the carnage of war in the novel, describing the story as "a kind of dream vision or wish-fulfillment fantasy expressing all that Sneider hoped might have happened for the displaced village of Tobaru." Sneider's vision of grass roots development and localized democracy was also ahead of its time. This theme would later make an impression with The Ugly American (1958), a novel which sold about five million copies and is often cited as an inspiration for the Peace Corps. Although the title would find a place in the English language as a phrase for boorish Americans abroad, its usage is rather ironic considering the original context: the "Ugly American" in the novel was actually the hero getting his hands dirty, and the ones criticized in the story were the diplomat elites. Authors Burdick and Lederer were against the policymakers' preference for top-down, large-scale modernization, instead preferring small projects at the village level like those carried out by the fictional Fisby. The many-layered Teahouse retains its charm and power today; beneath the comical mayhem that engulfs Tobiki we see the pitfalls and possibilities of cultural exchange. And though there's a sadness in the novel being so relevant - more than seven decades after the war there is still a large American military presence on Okinawa - it's uplifting to realise that Sneider's prescriptions for Western-style modernization alongside the preservation of local culture, and for a form of communally-minded capitalism, is essentially the path that Japan has followed. 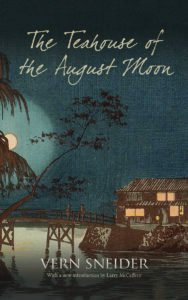 Teahouse of the August Moon is published by Camphor Press, in hardback, paperback and eBook, priced in local currencies.